Mozilla applications store your personal settings, added extensions and themes, and user data such as bookmarks, passwords, cookies and mail in a "profile". The Profile Manager allows you create and manage profiles. A new profile is useful for troubleshooting since it allows the application to run without extensions, themes, or customized settings. If you have multiple profiles you can use the Profile Manager to switch profiles. Care must be taken when creating and deleting profiles, to avoid loss of valuable data. This potential data loss may include non-Mozilla files. Be sure to read the warnings given below, here and here, before proceeding! SeaMonkey (or Mozilla Suite) users can access the Profile Manager from an open program window by selecting "Tools -> Switch Profile..." from the menu. You can use the -profilemanager command line argument when starting the application, as specified below. A capitalized -P in place of -profilemanager should also work. Note that the above examples are default installation directory locations. You can also find the executable file location by right-clicking the desktop (or Start menu) icon for your Mozilla program, selecting "Properties", going to the "Shortcut" tab, and then copying the "Target" location, as shown in this Firefox screenshot (from the Shortcut to a specific profile article). Once you've accessed the Profile Manager as described above, click on "Create Profile" and follow the instructions. Mozilla Suite/SeaMonkey users may have to click on "Manage Profiles..." first. Enter a descriptive name for the new profile and click the Finish button. Before starting with a selected profile, uncheck the "Don't ask at startup" option if you want the Profile Manager to appear each time you open the program; otherwise, the selected profile will automatically start each time. A new profile folder will be created in the default folder location. If you created the new profile because your old one was corrupt, you can import bookmarks and selectively transfer your other data to the new profile. If you wish to choose your own profile folder location, choose the parent folder where you want the new profile folder created. For example, if you want a new "ProfileName" folder created under D:\Mozilla\Profiles with the profile folder path D:\Mozilla\Profiles\ProfileName\<random>.slt, choose the Profiles folder. Unlike Mozilla Suite and SeaMonkey 1.x, a new profile folder is not automatically created when you choose the folder location for your new Firefox, Thunderbird, or SeaMonkey 2 profile. Whatever folder you select will become the profile folder. If you want to choose a custom location for your new profile, do not select a folder that contains existing data. You must create a new, empty folder (preferably with the same name as the new profile) and then choose that folder in the Create Profile Wizard. Note: If your operating system does not provide a "New Folder" button within the Create Profile Wizard, you will need to manually create the new folder. Warning: If the folder you select for the new profile contains non-Mozilla files (such as the "My Documents" folder on Windows), your profile data will be intermingled with the non-Mozilla data. This can result in the loss of all of the data in that folder, including non-Mozilla files, if you later delete the profile. (Bug 304290, Bug 302087). You can use the Profile Manager "Delete Profile" feature to remove a profile from the list of available profiles. You can also delete the associated profile folder and its contents if you select the "Delete Files" option but it is recommended that you choose the "Don't Delete Files" option unless you are sure that the profile folder contains no valuable data. Warning: The folder for the profile you are planning to delete may contain non-Mozilla files, if you created the profile in a custom location (see above). If you use the "Delete Files" option to delete that profile, the entire folder and all of the contents will be deleted, including any non-Mozilla files it may contain. This cannot be undone! For this reason, you should choose the "Don't Delete Files" option when deleting a profile. If you want to delete the profile folder, you can do that manually. You can use the Profile Manager "Rename Profile" feature to rename an existing profile but this is not recommended. Renaming a profile changes its name in the Profile Manager list of available profiles but does not change the actual profile folder name. If you use multiple profiles, renaming a profile can make it more difficult to tell which profile belongs to which profile folder without taking additional steps, such as checking the profile folder contents or looking inside the profiles.ini file and comparing the Name and Path. If you do rename a profile, any shortcuts (see below) must be changed accordingly. The profile name is case-sensitive and using spaces in a profile name will require enclosing the profile name in quotes in a shortcut. This can be a problem if a specific profile is called by an extension such as "Launchy" where the options don't allow quotes, so is best to avoid using spaces. In some Windows installs, a "Profile Manager" shortcut is placed on the Start menu programs list. For easier access to the Profile Manager, you can also create your own shortcut and place it on your desktop or in another convenient location. Go to the Firefox installation directory (usually C:\Program Files\Mozilla Firefox), right click the file "firefox.exe", and select the option "Create shortcut". Right-click and rename the new shortcut "Firefox Profile Manager", then right-click the shortcut again and select "Properties". 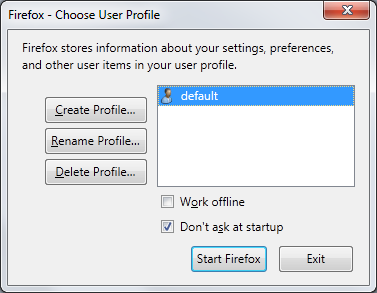 Drag the new "Firefox Profile Manager" shortcut to the desktop or other location. Double-clicking the new shortcut should now start the Profile Manager, assuming Firefox is completely closed and not running in the background, as mentioned above. "C:\Program Files\Mozilla Firefox\firefox.exe" -P "Profile Name"
Note: Profile names are case sensitive. See the article Shortcut to a specific profile if you need more help. If the Profile Manager tells you that the profile is already in use, or if you attempt to start your Mozilla application and see a message that the application is already running but is not responding, this means the profile is locked. See Profile in use for details. If you use Apple's Migration Assistant to transfer all of your files, programs, and settings to a new Mac computer and you see a "Profile Missing" dialog box which says: Your Firefox profile cannot be loaded. It may be missing or inaccessible. when attempting to start Firefox or the Profile Manager, see Profile missing after using Migration Assistant on Mac OS for a possible solution.